I went grocery shopping this afternoon, but I didn’t know that it will rain which cause us to me to get wet on the way to the car. Even though it was really gloomy out, I didn’t think of bringing an umbrella with me. I heard from my hubby that it would be like this again tomorrow. I already had a plan to go out with my friends and the bummer thing is that we don’t have an umbrella around the house. Right now, I’m shopping for an umbrella since I couldn’t find one at home. I found one in Target and the price iss pretty reasonable. 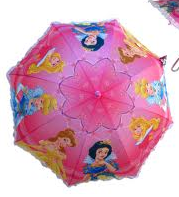 While surfing, I found one for our daughter and I’ll bet she will be surprised because it’s a princess umbrella. She’s been asking me to get her one of those umbrellas and this is the right time because it’s spring time. I can’t wait to buy one for her so we can use it tomorrow. Now I won’t get wet ever again because I will have my umbrella with to me.